Third-place Kentucky Derby finisher Audible, thought to be Justify’s top competition until pulled from consideration for the 2018 Belmont Stakes, will target races later this summer after removed from training, Todd Pletcher told the Daily Racing Form. DRF reported Monday evening that Audible was sent from Pletcher’s New York base to Kentucky for examination after he wasn’t training to Pletcher’s standards for a potential Belmont start. Of course, Audible shares the same ownership group as Justify, and could have threatened his Triple Crown bid. Seemingly, however, this alleviates concerns the Florida Derby winner didn’t go in the Belmont just to avoid an upset. The Jim Dandy runs July 28 at Saratoga. The Haskell is July 29 at Monmouth Park. Audible, a son of Into Mischief, launched his 3-year-old campaign with a victory in the Holy Bull (G2) before taking the Florida Derby (G1). 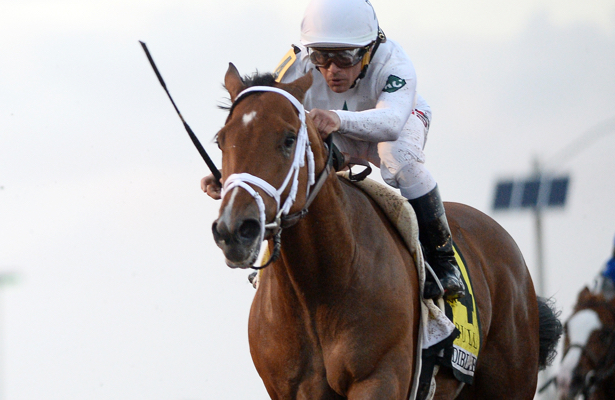 He was beaten just a head for the place in the Kentucky Derby while tracking down Good Magic in deep stretch.